Travel Service Europe - Holiday homes, Camping, Transportation, Information. Denmark comprises of more than 400 islands, of which 72 are populated. Sports are popular in Denmark, with football reigning supreme in popularity and counted as the national sport, followed by Gymnastics, Handball and Golf. Another trait of Danish culture as any tourist pamphlet will tell you, is "Hygge", translating into cosy or snug. Danes themselves will be quick to point out this is somehow a unique Danish concept, which is hardly in tune with reality, but it does probably take a more prominent place in the culture, than in many other countries. It usually involves low key dinners in peoples home, with long conversations over candlelight and red wine in the company of friends and family, but the word is broadly used for social interactions. Denmark is often praised as being the one of the greenest countries in the world, but apart from the ubiquitous bikes, the individual Danes are surprisingly nonchalant about the environment despite their reputation, and actually contribute as many greenhouse emissions as most other nationalities. As with so many other things, it is thought as a collective responsibility, and have safely been played into the hands of the government. Copenhagen (da. København) - Denmark's capital and largest city is a vibrant metropolis with world class attractions. Århus (da. Århus) - The main city of the Jutland peninsular and Denmark's second largest city, with its brilliant historic Open Air Museum of how the city looked in the 1800's. Odense - The main city of the island of Funen, and Denmark's third largest city, known as birthplace of H.C. Andersen, but The Funen Village Open air museum of 18th Century farm buildings, and the Egeskov Castle, one of the best-preserved Renaissance castles in Europe are also good attractions. Aalborg - Home of a historic and picturesque city centre and the rowdy Jomfru Ane Gade, which features some of the country's most vibrant night life. Esbjerg - Denmark's centre for the fishing and offshore industry, and a short 15 minute ferry ride away from the cosy island of Fanø. Sønderborg - Discover Danish mentality in a city where Denmark finally conceded its superpower ambitions, and wander through the old castle or the royal palace of Gråsten. 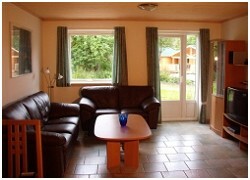 Herning - This small but ambitious town is an excellent entry point to the spectucular beaches of Jutlands western coast. Rønne - Capital and entry point for the intriguing holiday island of Bornholm, with its cozy villages, mystic round churches and the spectacular castle ruin of Hammershus. Nykøbing Falster - Nestled by a picturesque fjord, you can explore the old abbey, the castle, or set out to the spectacular chalk cliffs of Møn or the islands good beaches. The majestic chalk cliffs at Møns Klint. Legoland - Revive your childhood in the fantastic miniature cities or indulge with your kids in the thrill rides of home of the LEGO bricks. Grenen - Discover the mythical light that has inspired a phleora of painters in one of Denmark's sunniest spots, have your feet in two different oceans or chill in the picturesque village of Skagen. Læsø - Get away from it all in this remote island in Denmark's "desert belt", ride through the sand dunes on horseback and see unique farmhouses with seaweed roofs. Møn - Quaint and picturesque country side with viking burial mounds and the dramatic 128 meter white chalk cliffs of Møns Klint. 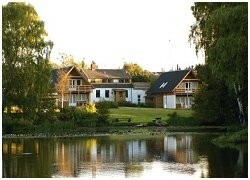 The Lake district - between Silkeborg and Skanderborg is one of the country's most beautiful areas. Denmark is not only the the gateway to Scandinavia in cultural terms, but certainly also geographically, and as such the country is well connected with the rest of European continent and to Scandinavia. A pheora of ferries connects Denmark with Europe and Scandinavia, and Copenhagen airport even more so serves as a the main Scandinavian hub, since its southern latitude makes it a natural stopping point for flights between Scandinavia and the rest of Europe. Touring Denmark by car is a wonderful experience and highly recommended. Margueritruten is a 3500 km long connected route of small scenic roads passing 100 important Danish attractions. It is marked by brown signs with the white Marguerite Daisy flower. It is marked on most roadmaps. Though not well known to casual visitors Denmark is an island nation, with 72 inhabited islands and a further 371 uninhabited ones. Apart from the well known blockbuster Bornholm, with its rich history, mystic round churches and links to the Knights Templer, many of the small islands are rarely visited by tourists, even though they make up for some of the country's most intriguing destinations. If you have the time consider visiting one of the two remote islands in the Kattegat sea - Læsø and Anholt, which locals jokingly refers to as the "Danish desert belt" since it sees much less rainfall than the rest of the country, and have large swaths of sand dunes covering much of the two islands, peculiar architecture and a laid back vibe. 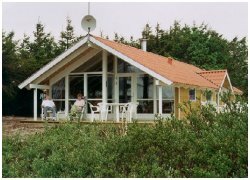 Also worth considering is the Island sea south of Funen, one of the country's most beautiful areas, which also includes the larger islands of Langeland and Ærø with some impossibly picturesque villages, lush green and hilly farmland and wild horses. Finaly in South Jutland, the islands of Fanø, Mandø and Rømø are located in the Wadden sea, a intertidal zone forming a shallow body of water with tidal flats and wetlands. It is rich in biological diversity, with seals and an amazing range of birds, but also have some spectacular beaches and cute villages. As Danish as it gets, Copenhagen's Nyhavn canal build in LEGO bricks in Legoland. Denmark is teeming with amusement parks, and indeed features some of the most famous in world; Copenhagen's Tivoli is one of the oldest of such parks in world, and by Walt Disney's own admission a major source of inspiration for his own Disneyland. Also in Copenhagen, nestled among majestic beech trees Dyrehavsbakken is the worlds oldest operating amusement park, and both of these parks features some of the oldest still operating rollercoasters in the world dating back to 1914 and 1932 respectively, and both receiving the ACE Coaster Classic Award. Just as famous is Legoland in Billund, the largest and the oldest of the now global franchise, with its spectacular miniature LEGO sceneries the star attraction, and a good selection of thrill rides to entertain kids. And while outshined by its world famous rivals, there are four other major amusement parks in the country: Sommerland Sjælland, Bonbonland, Fårup Sommerland, Djurs Sommerland, and a host of smaller one.